Jean-Baptiste Pierre Antoine de Monet, Chevalier de Lamarck (1 August 1744 – 18 December 1829), eften kent simply as Lamarck (/ləˈmɑːrk/; French: [lamaʁk]), wis a French naituralist. He wis a sodger, biologist, academic, an an early proponent o the idea that evolution occurred an proceedit in accordance wi naitural laws. 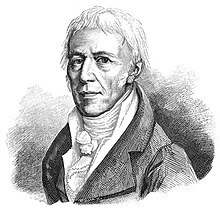 ↑ "Lamarck". Random House Webster's Unabridged Dictionary.